Vantage GTE is a version of the V8 Vantage road car and retains the same aluminum chassis, the core of the engine, cylinder block, cylinder heads and crankshaft of the road model. When you hear the words, “Aston Martin,” what comes into mind? Many of you would probably say James Bond, the fictitious character created by Ian Fleming, former spy for the British Secret Service and author of the James Bond series of spy novels. After all Bond did have a license to kill and he drove an Aston Martin. Many others of you probably think of the rich tradition of the Aston Martin nameplate and its racing teams that have been successful since its inception in 1913 when co-founder Lionel Martin competed in hill climb races at Aston Clinton in Buckinghamshire England. 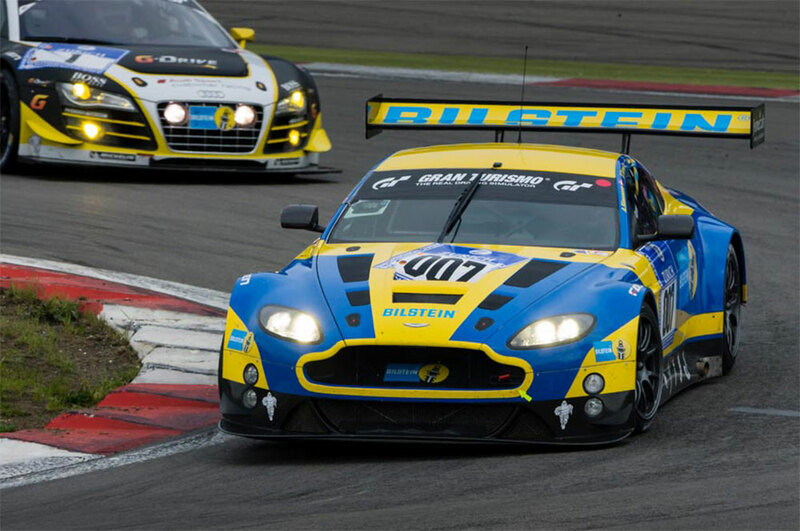 It also competes in the FIA World Endurance Championship Series and the Avon Tyres British GT Championship Series. 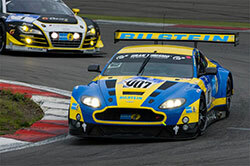 The factory team uses three cars in its racing campaign –- the Vantage GTE, the Vantage GT3, and the Vantage GT4. The GTE features the same aluminum chassis, engine core, cylinder block and heads and the crankshaft as the road model. The racing version weighs about 400 kg less than the road model, coming in at a light 1245 kg. Weight savings were due to the use of carbon fiber panels, which replaced the aluminum used in the body of the road car. It is also lighter because such items as the electronically controlled leather seats, in-car entertainment and sound proofing that are on the road car are missing from the racecar. A lightweight V8 engine that generates 480 bhp and 500Nm of torque serves as the powertrain. Vantage GT4 is the most popular GT4 car in the world. More than 100 cars have been produced and are currently competing in race series worldwide. The Vantage GT3 features an enhanced version of Aston Martin’s 6.0-liter V12 engine that generates more than 600 bhp with 700 Nm of torque. For 2016, the car has been fitted with new cylinder heads and camshaft and an improved oil and water radiator with much better airflow and cooling capabilities. 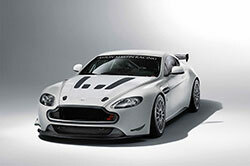 Equipped with the same bonded aluminum chassis of the Vantage road car, the GT3 is very light with stiff structure. It features a shorter wheelbase and lower engine position than the road version contributing to better handling and performance. The GT4 is perhaps the most popular racecar in the world. More than 100 units were manufactured and are currently competing in race series around the world. 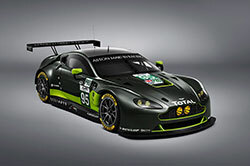 Vantage GT3 is powered by a modified version of the Aston Martin production 6.0-liter V12 engine. It produces more than 600 bhp and 700 Nm of torque. Its position in the car has been changed slightly compared to the road model to achieve the best weight balance. The racecar is based on the Vantage GTE road car and includes the same chassis, V8 powertrain and drive train along with a new 7-speed semi-automatic gearbox that permits quicker shift speeds. The springs and dampers of the road model have been enhanced for racing and include stiffened front and rear anti-roll bars and the ability to incorporate optional rose-jointed wishbones if required. The racing incarnation of the vehicle is 300 kg lighter than the road model and the 4.7-liter V8 engine generates more than 400 bhp. Nicki Thiim, a resident of Germany, is the 2014 LE Mans GTE AM champion and WEC GTE Am drivers’ champion; 2013 Porsche Supercup winner; and winner of the 2013 24-hours of Nurburgring. Marco Sorensen, a resident of England, was the Lotus F1 test and reserve driver in 2014 and winner of the 2014 GP2 Championship. Darren Turner lives in England and is the 2007-2008 Le Mans GTI Champion and has achieved multiple wins in the GTE Pro Victories in WEC. He has been an AMR works driver since 2004. Jonny Adam is a resident of England and is the 2013 and 2015 British GT champion, the 2007-2008 SEAT CUPRA champion and won the first race in the Aston Martin Vantage GT3 in 2012. Fernando Rees lives in Brazil and is the 2012 WEC GTE Am champion, 2010 European LMS GT1 champion. Richie Stanaway lives in England and is the 2011 German Formula 3 champion, 2010 ADAC Formula Masters champion. Paul Dalla Lana, a resident of Canada, has won two WEC GTE Am Drivers’ championships and is the multiple winner of the World Endurance Championship. Pedro Lamy, who resides in Portugal, is the multiple winner of the N24 and World Endurance Championship and the 2012 Class Winner of Le Mans. Mathias Lauda lives in Spain and achieved podium finishes in the 2012 GTI World Championship and is a multiple winner of the World Endurance Championship. Ross Gunn, who lives in England, is the 2011 and 2012 British Kart Champion, finished fourth in the 2012 World Karting Championships, is the 2015 British GT GT4 Champion and is the 2015 Aston Martin Racing Evolution Academy winner. So far in 2016 the Aston Martin factory racing team has won the Le Mans World Endurance Championship, also known as the 24 Hours of Le Mans; the second round of the FIA World Endurance Championship known as the 6 Hours of Spa Francordchamps; took first and second in the European Le Mans Series; took a double podium finish at the FIA WEC season opener; and a top four finish at the GTD class at the Rolex 24 at Daytona. K&N Filters sponsors the Aston Martin racing team. Other sponsors include Akrapovic, Bilstein, Dtex Systems, Goodridge, Hackett, Hella, HMG Paints Ltd., Immun’Age, IQ Option, Lifeline, Mount Anvil, Pagid Racing, Ontime Automotive, P&O Ferries, PTC, Schroth Racing, Spirent Communications, Super 8 Lithium Batteries, Total, TWS Forged, Valero, Vitra, and Wincanton Print Company.